A little island with a lot of history behind it, Daufuskie Island is situated between Hilton Head Island in South Carolina and the city of Savannah in Georgia. It's part of South Carolina and measures up at 5 miles in length and around 2.5 miles in width. 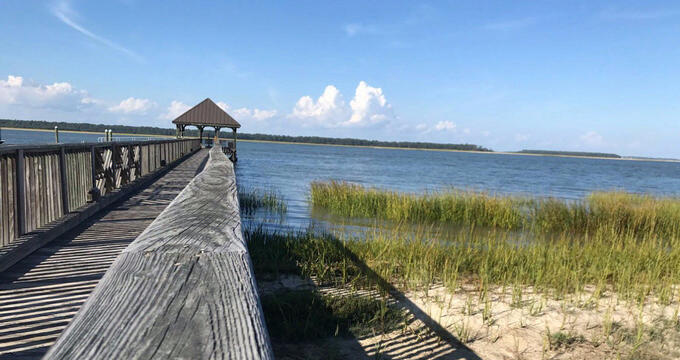 With plenty of soft, sandy beaches to enjoy and a permanent population of only 400 people, Daufuskie Island is a popular retreat location, generally regarded as one of South Carolina's best spots for people who just want to get away from it all and enjoy some rest, relaxation, and recreation in a picturesque setting. If you're planning a trip to Daufuskie Island, a stay at the Haig Point Club, typically known as just Haig Point, is a wonderful way to make your island getaway so much more memorable and enjoyable. With 300 homes spread out across over a thousand acres of private land, this stunning community offers an authentic slice of Daufuskie Island life, complete with 29 golf holes across two separate courses, tennis courts, swimming pools, private beach access, fitness centers, multiple dining options, an equestrian center, and more. Home to all sorts of wildlife, making it a truly idyllic location for nature lovers too, Haig Point can offer so much for every guest and member. The sort of lifestyle you can enjoy at Haig Point is beyond compare. With over a thousand acres of private island land to enjoy and explore, members of the Haig Point Club can truly feel part of an exclusive community with luxury amenities and stunning scenery to be enjoyed in every direction. For both relaxation and recreation, there's no better place to be. Haig Point particularly excels in the field of sport, with two large golf courses, a two-way driving range, a large golf clubhouse, and a pair of practice greens. The Rees Jones Signature Course features 20 holes with two different routings to choose from and has been highly praised by leading experts at Golf Digest and other publications. There's also the Osprey Course, a 9-hole course with a simpler layout, ideal for casual afternoons of family fun or relaxing moments with a partner. Tennis fans will find no less than six Har-Tru courts around Haig Point, with various clinics and workshops being held throughout the year to help you improve your game, regardless of skill level. As well as these sports, Haig Point features a full equestrian center and plenty of horseback riding trails to enjoy all around the island, with other activities like fishing, water sports, cycling, Bocce ball, and more organized and held at Haig Point for members of all ages to enjoy. Other key locations for Haig Point members include the spacious Clubhouse, which can be reserved for weddings, dinners, and other special events; the Calibogue Club restaurant, which serves up a fine array of dishes and provides magnificent waterfront views; the 30th Hole Grill, for more casual dining after a few rounds of golf; and the Beach Club, where you can relax by the side of the pool with a good book or good company. If you're looking to purchase a home at Haig Point, you can choose from existing structures, newly constructed homes, or even request to have your own new home built to your standards. There are many advantages to home ownership at Haig Point, including full use of all the community amenities and the peace of mind that comes from knowing your home is located in an entirely safe and secure environment. With golf courses, clubhouses, and more just a short ride away from each home, and all homes also boasting outstanding views of locations like the lake, lagoon, or golf courses, a house in Haig Point is more than just a place to rest one's head, it's a warm, welcoming, elegant home in which one can escape from anything and enjoy the wonders of island life. The Haig Point Club offers a variety of membership plans and levels to cater to everyone. All homeowners at Haig Point are full members, but even if you don't necessarily want to own any property on the island, you can still become a member and visit whenever you like to take advantage of the exclusive benefits and amenities afforded by your membership level. It's important to note that all membership levels come with use of the ferry, full access to the dining areas, parking spaces at the embarkation point, and use of the tennis courts. Read on to learn a little more about some of the membership plans at Haig Point. Designed with golf enthusiasts in mind, the Signature Golf Membership offers full access to the 29 holes of golf at Haig Point, letting you play as often as you like and make use of all the extra facilities like the driving range and practice greens whenever you want. If you like golf but also enjoy other sports and activities and like to enjoy a lot of variety, the Signature Club Membership could be just what you need. It still lets you access the courses, but offers a reduced level of access compared to the Signature Golf Membership, offering full access to other amenities and activities like tennis and horseback riding too. Perfect for people who don't plan on owning a home at Haig Point for now but still want to be a part of the community and enjoy the various amenities and activities. If you live more than a hundred miles away from Haig Point and don't own a home in the community, you can choose a National/International plan and enjoy all the amenities and facilities, but these memberships are highly limited so you'll need to act fast if you want one. Interested in all Haig Point has to offer but want a little taster before committing to full membership? If so, the Discovery Experience is all you need. The Haig Point Club offers weekend breaks for anyone interested in testing out the luxurious Haig Point lifestyle. You'll be staying for three nights at the iconic 1873 Lighthouse or the elegant Strachan Mansion, able to enjoy the delights of the community, with plenty of bonuses included.